I wonder if that is dental floss they are using? I hear it works well on piano. "Mayak is an interactive sound installation consisting of four LTE-modems connected to four Wi-Fi routers. 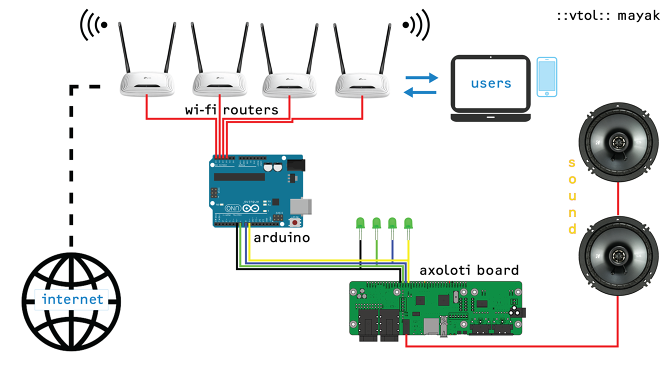 The LED responsible for the display of the Wi-Fi-based data transmission from each of the routers is connected to an Arduino board. Arduino analyses the "flashing", and triggers the synthesizer generating sounds. To all intents and purposes, the installation represents four open Wi-Fi Internet access points. By connecting to these points, people influence, through their network activity, a rhythmic sound generation process." "Ever since I was a child, I have adored the display of information through light-emitting diodes, green ones especially. And above all in telecommunications systems. For many years I would observe with wonder the behaviour of LEDs in network devices. One day my Wi-Fi router, which stands out due to the particularly active display of data packet transmission, led me to come up with the idea of transforming this flashing flow into something different, furthermore by the most primitive possible method of implementing it directly in the router’s hardware. I started selecting Wi-Fi routers with the most interesting data transmission interpretation algorithm, which would react rapidly and sensitively and display all developments on the network." I love this experimental stuff - probably not that musical, but what a source of inspiration for sound designers! Instant sci-fi movie backing track. "Koka's beat machines are electromechanical musical instruments, which are programmable and produce different kinds of rhythmic and melodic patterns"
"RITUAL for a 3D Printer is an electroacoustic musical piece composed for a machine. This work is another turn on investigating some essential aspects of musical expression and examining dramaturgic potential of mechanical objects. Monotonous motion, repetitive evolvement, irregularly pulsing passages and then straightened rhythmical patterns, all are silhouettes and shadows of different rituals."